These are the specific standards applicable to PORK. Market animals to be sold under the grass-fed standards shall be pasture raised. ( supplemental grain, nuts , seeds, fruits and other nutritious foods may be fed as well). Animals may be sheltered due to: 1) Farrowing/nursing, 2) to protect them from extreme weather conditions, 3) to prevent “pugging” of the soil during wet weather. No growth hormones shall be used in production. Vaccinations and worming medications are allowed. The pasture standard requires no commercial (petroleum based) fertilizers and no pesticides applied to the field. Grazing animals cannot have a detrimental impact on riparian areas. These general standards apply to all animals moving into North Cascades Meat Producers Cooperative’s retail and wholesale meat program carrying the North Cascade Meats™ label. 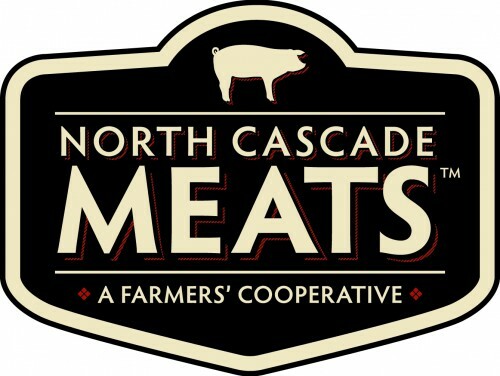 Farm Members selling their animals to North Cascades Meat Producers Cooperative for the North Cascade Meats™ branded program will be required to meet all of the standards above. The community will have access to this pork through local grocers, restaurants and institutions that support the program. Although the one-time Member Share investment to farmers is slightly higher at this level (by $500), these farm members will always be fairly compensated for their animals and will never need to spend time or money marketing their meat directly.